The faith that gave birth to tolerance is no longer tolerated! 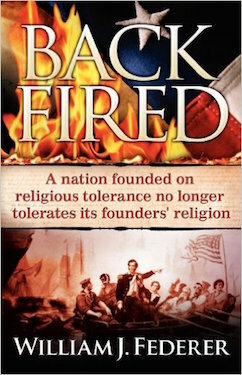 The Ten Commandments taken down, “Under God” removed from Pledge, Prayer prohibited, Nativity Scenes banned, Religious Art & Music censored, Salvation Army & Boy Scouts defunded, Christmas carols disallowed… How did America go from Pilgrims seeking freedom to express their Christian beliefs to today’s discrimination against those very beliefs in the name of tolerance? “From its beginning, the new continent seemed destined to be the home of religious tolerance. Those who claimed the right of individual choice for themselves finally had to grant it to others.”- Calvin Coolidge, May 3, 1925 *DISCOVER HOW TOLERANCE TRANSFORMED ->From Pilgrims ->To Puritans ->To Protestants ->To Catholics ->To “Liberal” Christians ->To Jews ->To Monotheists ->To Polytheists ->To All Religions ->To Atheists ->To only the Politically Correct. “The frustrating thing is that those who are attacking religion claim they are doing it in the name of tolerance…. Question: Isn’t the real truth that they are intolerant of religion?”- Ronald Reagan, August 23, 1984.